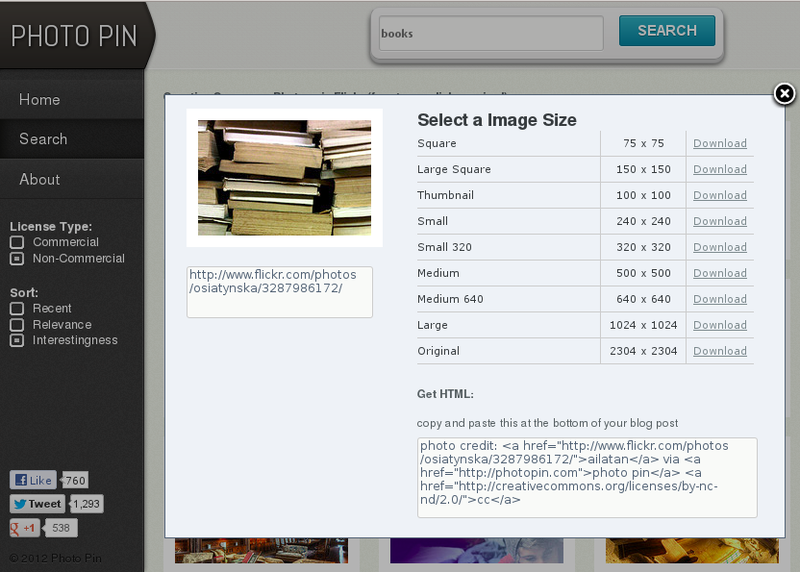 Photo Pin searches for Creative Commons images on Flickr. Flickr has an advanced search option for exactly that, but Photo Pin simplifies the download and attribution process. This is a K.I.S.S. * product, reducing the effort needed to find and credit photos. The primary purpose is described as giving access to photos for blog posts. Unless you take your own photos, you should always use photos that use a liberal license such as the ones available through Photo Pin. Photo Pin connects to Flickr, where thousands of people have posted photos, but only searches for photos that have a Creative Commons liberal license. The following screen capture documents a search for “books” and the particular image shown has one of the Creative Commons licenses that is pretty restrictive. “Attribution, Non-commercial, No-derivatives.” That means I cannot use the photo for advertizing a product, or sell my blog post with the photo in it, or make changes to the original. I also need to display credit for the photo. Fortunately, that’s one of the things that Photo Pin makes very easy. In the left column, you see the license limitations clearly identified. At the bottom, you’ll find a complete credit, set in html code that is typically easy to add to a blog post or other web page. Past the code below the image or at the end of the post, whichever is appropriate for your situation. Just be sure you do the attribution. That’s the basis of the Creative Commons licenses, no matter what other restrictions are applied. You do still need to verify that your use is valid. There are several licenses under the Creative Commons umbrella. They range from allowing almost any use to very limited use. They do stop short of full equivalence with standard “all rights reserved” copyright. Read the terms and know your use fits before you use a photo. Always comply with the attribution requirements, too. You are being a good digital citizen, encouraging others to share with you. While Photo Pin specifically targets educational bloggers, the tool is also valuable to anybody who wants to legally add photos to their digital works. Give back. That’s next, of course. Share your own photos on Flickr. Use a Creative Commons license when you do. Please consider using the least restrictive license you can. Your work will go further and do more good if you do. *K.I.S.S – “Keep it Simple, Stupid” which in the case of Web design is a very good thing.